EZ-Peel Labels feature a unique design with standard EZ-Peel deadened adhesive zones on both the right and left sides of each label. This makes all of the cleanroom labels that you use easy to peel and position, even if you’re wearing protective gloves while you do so. Removable EZ-Peel Labels have a few key benefits that make them ideal for a large number of different types of situations. These include the fact that they can be easily removed from most surfaces when a particular label is no longer needed. Additionally, these labels can be reapplied at various stages to follow a single product through the entirety of the production process. The major benefit of permanent labels comes from the fact that they are highly aggressive. Once the label has been properly cured, they are ideal for long term identification on most surfaces. 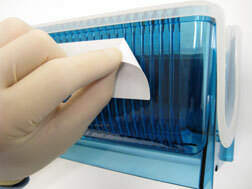 Contact us to find out more information about our selection of EZ-Peel or cleanroom labels. We can’t wait to help you with any concern that you may have.